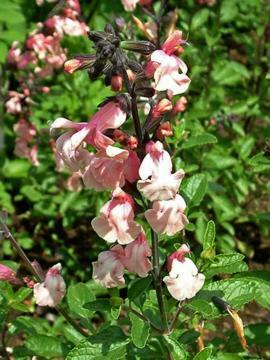 Soft pale pink flowers, set off by dark greyish purple calyces, freely produced over a long period in summer and autumn. Small green leaves. Slightly untidy, bushy habit. Well drained soil in a warm sunny position. Borderline frost hardy, but normally over-winters in mild areas.